I am so pleased with how this layout came out especially as I tend to have sentences as my titles! 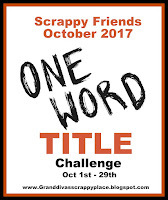 I'm therefore entering it into Grand Diva's One Word Title challenge this month. Challenge doesn't end until 29th October 2017. Beautiful page! Thank you for playing along at GCC!